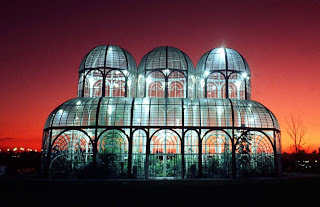 Curitiba - the ecological capital of Brazil. 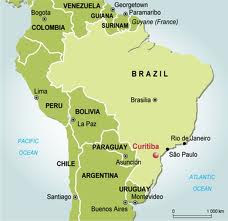 There are a lot of large cities in Brazil. And most of them have similar problems which are typical for the “Third World” cities. Among them there are poverty, overcrowding and insanitation. Curitiba is a rare exception. 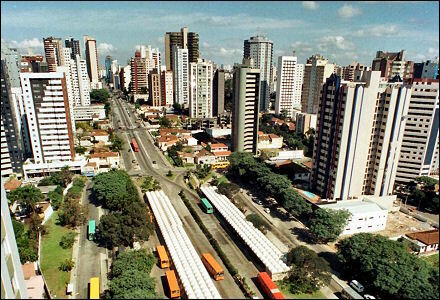 This city (population of 1.6 million people) is called “the ecological capital of Brazil”. Such a miracle was created by Curitiba Scientific Research Institute of Urban Planning. In 1965 the city master plan was developed. It provides for extension of the green plantations areas and the priority of public conveyances development. Curitiba has radial-circular planning. Five wide thruways joint by belt roads disperse from the centre. At the beginning the surrounded woodland parks restrained an increase of city building up. So when internal growth powers ran out, five residential areas appeared around the city and thruways linked all the areas to the city centre. So the central traffic lanes of the arterial highways are set aside especially for high-speed and express buses. There are separate lanes for cars also. Safe and effective bus routes system was made thanks to the traffic streams differentiation. About 1100 buses make 12 500 trips and transport 1.3 million passengers a day. That covers 55% of Curitiba transport needs. With the increase in population (it has trebled last years) the bus network also was growing. 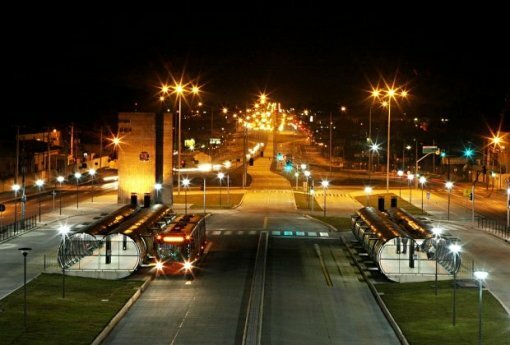 Now five bus types allow people to get to every city place without problems and excessive expenses. The first type is express-buses. They run along the middle lanes of those five wide thruways. The second is high-speed double buses that also go along the middle lanes. The busload of such buses is 270 passengers, they are of local production and they appeared here in 1992. The third type is high-speed buses going along the thruways and the wide city streets, their busload is 170 people. The fourth route’s type connects city districts located between thoroughfares. And finally the fifth type is dense network of short routs covering the whole city territory. These routs bring passengers to terminals where people can change to one of the high-speed buses. The buses going along different lines are painted in five colors: red, silvery, orange, yellow and green to comfort the passengers. In 1991 bus network was fitted out by stations with roofs and turnstiles like subway. It was possible to intensify passenger traffic and three times enhance it thanks to reduction of time necessary for the passengers boarding. The spread of express-routes network is 54 km and others’ is 500 km. Such system covers 65% of city area. Moreover this surface “subway” is very advantageous for people who pay fare only one time. The passenger can get from one city district to another for 55 cents; sometimes it is cheaper than by subway. That became possible because of unified investments to city transport system. 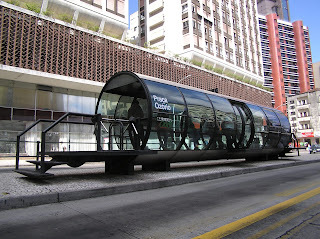 Curitiba bus lines belong to private companies which work is coordinated by united center. It succeeded in combination of society interests (safety, effectiveness and availability of transport lines) and private interests. We should note that companies-owners don’t get any subsidies but are financed from the found increased by public transit’s incomes. Thanks to wise management the citizens’ fare expenses are only 10% of their common transport expenses. 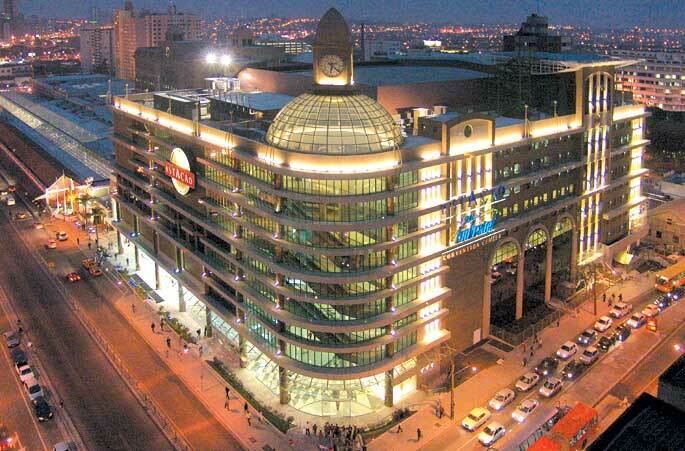 As a result Curitiba consumes petrol 30% per head less than the other Brazil cities. One car is accounted for three people, and Curitiba is the second Brazilian city by this index. The atmospheric emission slumped and road traffic became less intensive as a result of such transport policy. The residential areas stretched along the thoroughfares. Such city-planning in combination with effective public conveyance system made it possible to unload Curitiba centre. Fifteen city blocks in the centre were changed into pedestrian zones. It is also interesting, almost detective story happened with them. Building of the pedestrian zones started in 1972 and local shopmen gave it a hostile reception, they were afraid of the decrease in their incomes. It came to court. But the next major Jame Lerner began building without doubts. An architectural engineering appeared in the streets late at night on Friday. Two pedestrian blocks were ready by Monday morning. Shops’ owners and sellers came to work and were presented with a fait accompli. The court decision forbidding pedestrian zones was published only on Thursday. But it was too late. Enraged drivers decided to make a protest. But when they arrived to building place they saw a lot of children from surrounding houses. Boys and girls unrolled huge pieces of paper along the streets and painted there. Citizens liked “The Drawing Holiday” so much that it became a tradition, which repeated every Saturday. Sellers also had a lot of advantages because pedestrian zones attracted a lot of people, trading volume increased extremely much. Now local authorities want to build 150 km of bicycle tracks. City managers pay attention to ecological education of citizens. Without that all efforts on the creation of “ecocity” would vain. All conservancy activities go only thanks to reciprocal responsibility of the citizens. There is the Free Ecology University here. Its edifice is good example of successful ecological solution. During its building different secondary materials were used, even old telegraph-poles. Speaking about secondary materials, Curitiba program “Refuse is not refuse” was commended by UNO award. 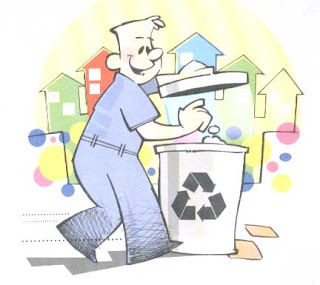 As a result of well thought-out system of the ecological education near 90% of Curitiba citizens not only throw out their garbage but give it to recycling like in Hamburg or Oslo. Besides that information is an important aspect. Everywhere in the city there are a lot of information billboards for people to read in detail about Curitiba, its districts, its historic and architectonic sights and also about cultural, social and ecological programs which have made “the Brazilian miracle” of Curitiba. New projects are always discussed on the newspapers’ pages. Today’s Curitiba major Rafael Greca pays great attention to the city social programs which accounts several hundreds: from perfection of the library system to help for homeless people. A peculiarity of such programs is prevention from parasitic attitude which became a scourge of poor districts even in such rich countries as the United States. Curitiba administration knows about folk wisdom: you can feed hungry men only one time with a fish and feed him for life with a fishing-rod. Educational program LICEU is very interesting. It is the system of professional trainings. People can graduate from the courses and get a specialty of motor mechanic, cook, hairdresser, programmer or the other necessary one for the city. Most of lyceum’s pupils are yesterday’s peasants and migrants with no education. Municipality buy houses in the new city district and reequip them into trade schools. For better adaptation to the city environment pupils study at little schools not at big ones. A great number of such colleges are situated near Curitiba residential districts where a lot of pupils live. $4 is the fee for three months in LICEU. A program “A Way to Work” was developed for the poorest city districts. Rebuilt and reequipped buses became classrooms. Every term they remove from one district to another and stay for three months there. During four months more than 100 000 specialists graduated from the program “A Way to Work”. Some of the programs are intended for new workplaces making. One of them is called TUDO LIMPO (Everything is clean), it recruits jobless people to put their yards and houses in order and cleanliness. At the same time people not only draw salary but also change their relation to the residential areas where they live. They transform their muddy streets into cozy and clean places. But such programs are not enough for some categories of people, for example, alcoholics and drug addicts who need rehabilitation before supporting themselves. City created the farm “Fazenda” where recovering people work and pass the first phase of medical treatment. 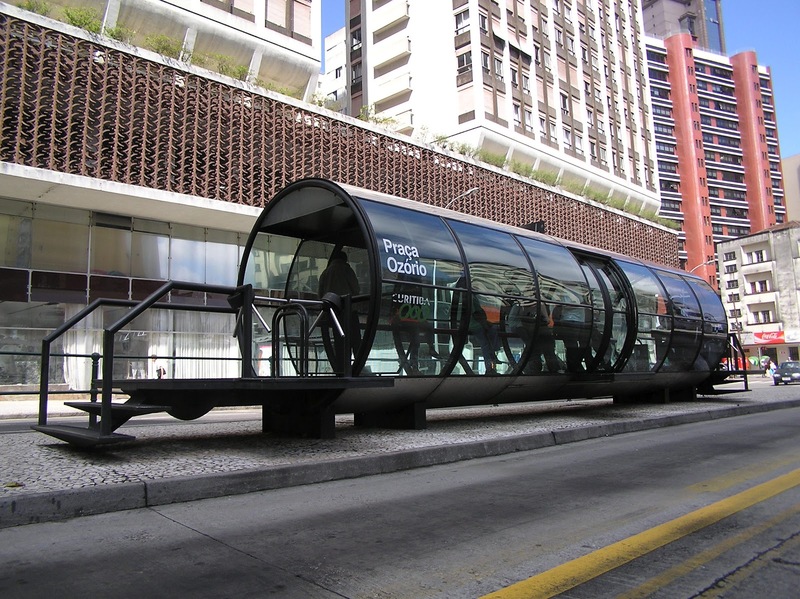 All these programs are simple and inexpensive but too efficient, they are a fundamental part of the city-planning transforming Curitiba into the city FOR people. They pursue an aim to change people consciousness and help them to feel themselves like heads of their city and of their life. The local authorities initiated a number of programs to educate children to be loving and careful heads of their city. 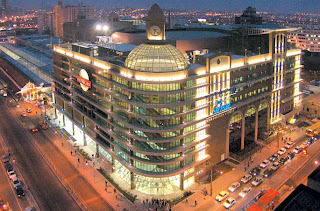 Curitiba is the most quick-growing Brazilian city. Thanks to its social programs and unique friendly climate Curitiba attracts a great number of migrants. The squatters occupying empty adobes (such settlements are called “favelas” here) is a big problem for many Brazilian cities. And at the same time it is the first index of that city can’t manage with the influx of new inhabitants. How is this question decided in Curitiba? New roads are built in the outskirts of the city, and along these streets there are new lots for sale. 60% of settlers look for a job in the building trade and so these people already don’t have obstacles in building of their own houses. When a future homeowner buys a plot in the city he will also get two saplings and free architect’s consultation. It is necessary to strengthen people and help them to choose a house type and the local powers realized an idea of “The Street of the Technologies” where every house is built with different technology. The name of Curitiba ex-major Jame Lerner became a symbol of the thriving state. He was a city head during 25 years, since 1970. He had an education of architect and he could unite a group of like-minded persons round him. 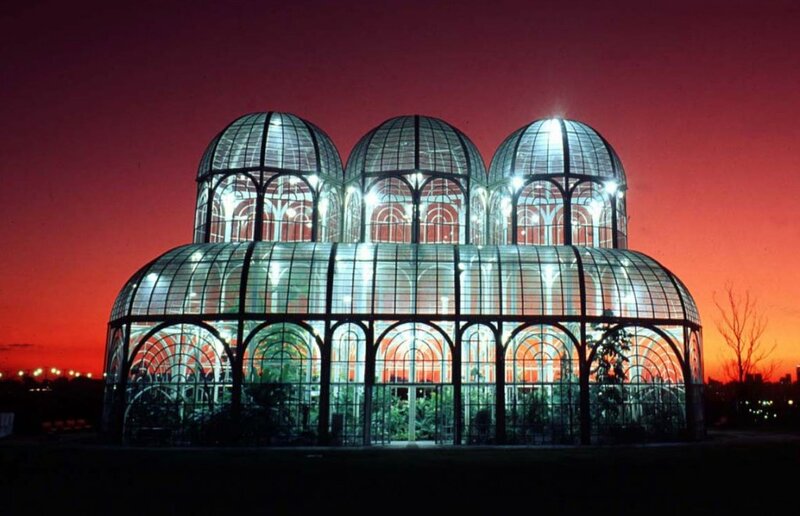 And they made Curitiba an ecological capital of Brazil. Now Lerner is a governor of Parana state, Brazil. And no wonder that his political rating is one of the highest ones. Or Join us on Facebook and Linkedin! This was amazingly done! Great work on this city which is considered one of the best cities to live in Brazil. I've been there before and I confirm what was said here, the city is great and follows a level of development not seen in other states in Brazil. It` amazing how little we know about good ptactices that have already been implemented in these parts of our planet! Surely, a question arises - Are we somehow intently kept in a kind of blissful ignorance?